Brick Town Talk: Inspiration of the Day - 11/20/11 - LEGO Town, Architecture, Building Tips, Inspiration Ideas, and more! 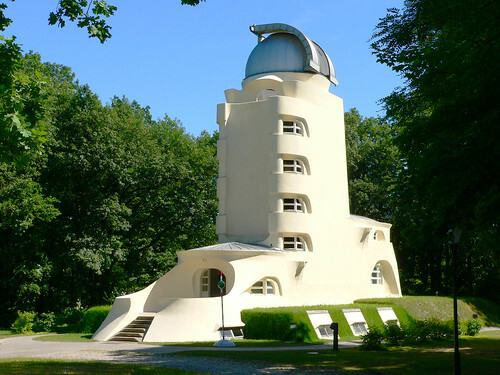 Potsdam, Germany - (BTT) A landmark of Expressionist Architecture, Erich Mendelsohn's Einstein Tower is a true survivor. Construction started in 1919, but by the time the building was fully operational in 1924 there were already problems with the facade cracking, due in part from the materials being changed from concrete to stucco covered brick without any alterations made to the design. In World War II the building was heavily damaged in the Allied bombings of Potsdam, but thankfully its significance to the world of architecture was realized and it was repaired. While the upkeep on the Einstein Tower has been a bit on the steep side - the most recent renovations being completed in time for the 75th anniversary of the building - I don't think it is controversial to say that it has been money well spent.